We are humbled to be chosen as Gulfshore Business Magazine’s 2017 Best Of Business. We would like to thank the readers and our customers for choosing us. 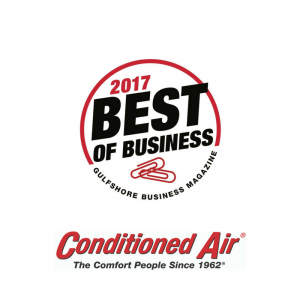 At Conditioned Air we are all about your customer experience and stand behind our work 100%. Thank you again Southwest Florida for believing and trusting us. To our great employees, thank you for keeping Southwest Florida Cool day in and day out. This award belongs to you.